More about the TCP protocol can be found on Wikipedia or Simple Wikipedia. To display listeners and connections on Linux you’ve to use the netstat or ss command. While older Linux boxes only support netstat, newer Linux distributions use netstat and ss in parallel. However, with the introduction of ss, netstat is marked as deprecated. # Display only TCP sockets / connections. # Display only UDP sockets / connections. The most common states are relatively simple: LISTEN, CLOSED and ESTABLISHED. Most of the developers don’t need to know more about TCP states, because this is what an application really cares about. However, there’s more going on under the hood of the TCP stack. Let’s have a look into how a TCP connection will be initiated. 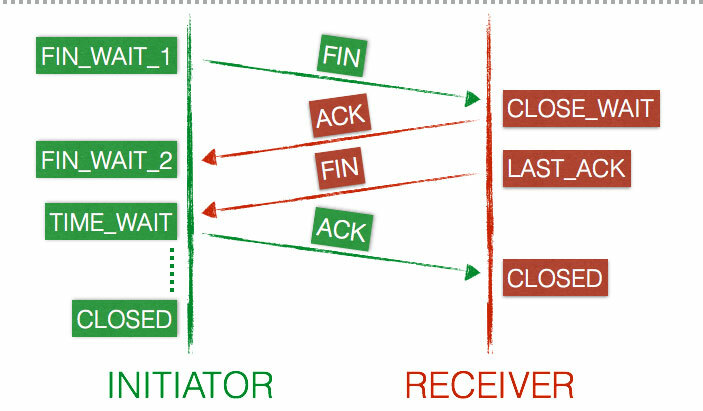 Before a TCP connection can be opened, you need to have a server with a listener. The listener will listen on incoming connections on a specific port. This state is represented as LISTEN. When a new TCP connection is opened, the client (initiator) sends a SYN packet to the server (receiver) and updates its state to SYN-SENT. The server will then send a SYN-ACK in reply to the client which changes its connection state to SYN-RECEIVED. If everything worked properly, the client will reply with an ACK and the connection is marked as ESTABLISHED on both end-point. Now the client and the server are ready to transfer data. The client sends a FIN packet to the server and updates its state to FIN-WAIT-1. The server receives the termination request from the client and responds with an ACK. After the reply the server will be in a CLOSE-WAIT state. As soon as the client receives the reply from the server, it will go to the FIN-WAIT-2 state. We already wrote that the termination of a connection is a four-way handshake. So while the connection is terminated from a client point of view, the server has to terminate its connection as well. This happens directly after the server sent its last ACK. The server is still in the CLOSE-WAIT state and it will independently follow up with a FIN, which updates the state to LAST-ACK. Now the client receives the termination request and replies with an ACK, which results in a TIME-WAIT state. The server is now finished and sets the connection to CLOSED immediately. The client stays in the TIME-WAIT state for a maximum of four minutes (defined by RFC793 and the maximum segment lifetime) before setting the connection to CLOSED as well. There’s also a three-way handshake alternative available, which occurs when the server sends its ACK+FIN in one single packet (server goes from ESTABLISHED to LAST-ACK in a single step). 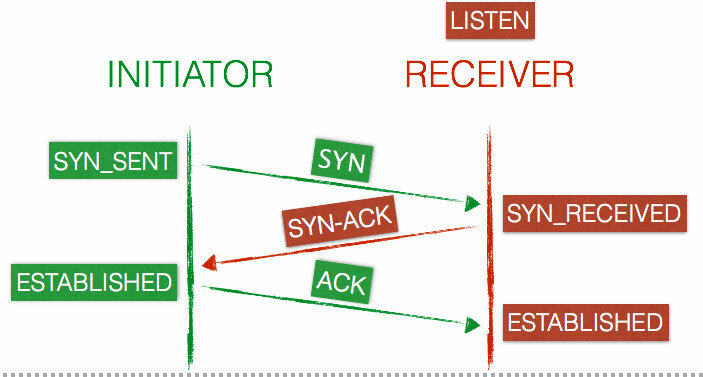 For first communication between client and server (in picture 1) shouldn’t it need to be SYN packet instead of ACK ? Is it typo (as ACK is repeated)? But it is nice article to get brief idea about TCP states. Thanks. You’re right, that’s a typo… oops! sorry! well done. its clear explanation of the sequence. it help me alot, good article!